Alfred Richard Orage was born on January 22, 1873, in Dacre, Yorkshire, England, and died November 6, 1934, in London at the age of 61. George Bernard Shaw said he was the most brilliant editor England had produced for 100 years, while T. S. Eliot said he was "the finest critical intelligence of our day. "1 A schoolteacher in Leeds, Orage was blessed with an agile mind interested in post-Socratic philosophy and theosophy, as well as political involvement in the Independent Labour Party. With his friend Holbrook Jackson, who introduced him to Nietzsche, he also founded the Leeds Art Club, which became a major avant-garde cultural influence in pre-World War I Britain. In 1907 Orage and his wife, Jean Walker, moved to London where he bought and for seventeen years edited the weekly magazine The New Age. The magazine became a respected voice in socialist politics and cultural trends. 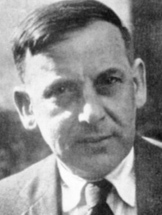 Becoming interested in psychoanalysis, Orage formed a study group of psychologists, which included Maurice Nicoll, one of Carl Jung's foremost exponents. In December 1923, Gurdjieff sent Orage to America to raise funds and introduce the teaching. Afterward, Gurdjieff directed him to remain in America to organize and lead study groups. Orage also worked with Gurdjieff to translate from Russian to English the first version of All and Everything, as well as Meetings with Remarkable Men. The teaching and translation responsibilities continued for seven years. About the translation, Orage said, "The period for perfect translation has not yet come; it should come around 1970. "4 Jessie Richards Dwight, who co-owned Sunwise Turn, a bookstore in New York where Orage gave his first talk, became his secretary. In 1927 they married, to the disapproval of Gurdjieff who thought her "pampered." In 1931 Orage was deposed by Gurdjieff and his groups were formally disbanded, as Gurdjieff believed they were working under the misconception that self-observation could be practiced in the absence of self-remembering. Members were then readmitted to groups after taking an oath not to communicate with Orage. Interestingly, Orage himself also signed the oath. Gurdjieff considered Orage as a friend and brother, but felt his choice of Jessie as his wife put him under a negative influence. In 1932 the Orages returned to England and founded The New English Weekly, upon which he worked in spite of a deteriorating heart condition. No longer directing groups, Orage became deeply involved with political issues and the Social Credit Plan. In January 1934, Senator Bronson Cutting presented Orage's Social Credit Plan before the U.S. Senate as one of the tools of Roosevelt's economic policies; the news appeared in the 2 February issue of The New English Weekly.5 On November 5, 1934, Orage broadcast a speech on "Poverty in Plenty," while experiencing chest pain but finishing his speech. After leaving the studio, he spent the evening with his wife and friends and made plans to see the doctor next day. On reaching home he went to bed and died in his sleep.6 Hearing of his death, Gurdjieff wiped a tear from his eye and said, "This man...my brother." Among the numerous quotes attributed to Orage, the following may point to the influence of Gurdjieff and his teaching. Among his literary contributions to our understanding of Gurdjieff and his teaching are: The Active Mind-Adventures in Awareness; Psychological Exercises and Essays; Commentary on the Teachings of G. I. Gurdjieff; On Love: Essays and Aphorisms; Consciousness: Animal, Human and Superhuman. Additional literary compositions and books include An Alphabet of Economics; Nietzsche in Outline and Aphorism; Frederic Nietzsche: The Dionysian Spirit of the Age; Readers and Writers; The Art of Reading; Selected Essays; Selected Writing on Economics. 1. A. R. Orage, The Active Mind: Psychological Exercises and Essays (New York: Samuel Weiser, 1974). 2. William Patrick Patterson, Georgi Ivanovitch Gurdjieff: The Man, The Teaching, His Mission (Fairfax, CA: Arete Communications, 2014), 113. 3. William Patrick Patterson, Struggle of the Magicians: Exploring the Teacher-Student Relationship (Fairfax, CA: Arete Communications, 1998), 83. 6. Philip Mairet, A. R. Orage: A Memoir (New Hyde Park, NY: University Books, 1966), 118–20. 7. A. R. Orage. On Love & Psychological Exercises (York Beach, ME: Weiser Books, 1998).